I got it!!!!!! It stayed at $7.99 till the last two minutes then shot up to $1.00 more than my highest, so I quickly put in a couple bucks more and we got him! YEA!!!! Thanks to you and your website, I couldn’t have found it without you! I will keep checking back to see if I recognize any of the other lost lovies. Hi, I am looking for a backup for our precious Knuffle Bunny. He is the PBK pink bunny that is flat and stitched on the tummy. He is 21 inches from the tip of his ears to his feet, but sits 12inches high. My 17 month old daughter loves her Knuffle Bunny (named after the story by Mo Willams) and takes it everywhere she goes. By the time I realized it was the one, the season had passed, and it was no longer available. I have scoured the internet and haven’t seen it. The closest thing I have found was the brown bear on your site that the mother was looking for, for her twin boys, and the one advertised on eBay for $50. My heart skips a beat when I think of losing Knuffle. We lost my daughter’s chewy when she was a baby, and can’t bear to go through the loss again. I had a blankie as a child (I still have it :), and understand, but my husband just has no sympathy, men! I see that someone else is looking for a pink bunny, not sure if it is the same one. But, since we are seeking a backup, I understand if we are last in line. Thank you for taking the time. I look through the lost pics in hopes we have an unwanted item that someone is looking for. Haven’t found one yet…..
Ann was looking for the same bunny, with a very similar story, but she has FOUND one! I bought this bunny when my little girl was born and never thought to get a second one as we didn’t know then she was going to like this bunny so much. Abby falls asleep with this bunny while she plays with the labels on the back. I contacted Pottery Barn but there’s no more bunnies in stock. I’ve looked on Craigslist and eBay, and I did find one on eBay, but they are asking $50 for it since it’s a discontinued product. 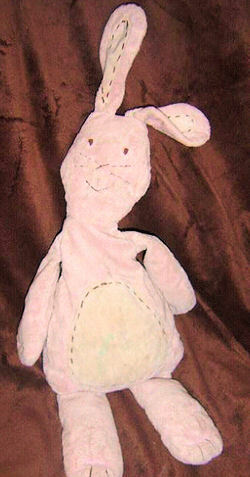 If you can help Gina find this Large Pottery Barn Kids Pink Rabbit with Stitching, THIS SITE IS NO LONGER ACTIVELY MANAGED. Please use Our FREE FACEBOOK GROUP, including #100908-4 in the subject, . I still have the white lamb, but not the rabbit. Let me know if that will work for you. #100908-4 Just in case you didn’t see the last comment. I still have the white lamb from PBK but not the rabbit or the bear. Let me know if you are willing to take it off my hand. Only $8 which is the orginal price plus shipping, it is brand new. #100908-4, There is a blue dog on ebay Item number: 180296200499, asking for $54. I’m looking for the same bunny, I’ll keep you updated if I find anybody out there that has this bunny. Thanks Ann, I will also do the same. We have “lost” Knuffle around the house and my heart sinks everytime, I am constantly on guard when we leave the house, to make sure we dont loose him. I’ve got my two boys (5 and 3) trained to look for him too. I am considering writing on a ribbon and sewing into his backside. If someone were to find him, they will know he is loved and wanted, not a garbled up bit of fluff(which he looks like). There is a current listing on eBay, item 270296269547. It is insanely overpriced, at 99.99 buy it now, but I thought I would tell you in case you didn’t know about it yet. I will check it out, because I am curious, but 99.00 is way out of my price range, being a SAHM in SoCal. Ann, if you can manage, go for it. $99!!! There’s no way I can pay this for a bunny! I send the user an email asking/telling hom or her that the price is a bit steap. I’ll probably not get an answer but I had to do it. I’m still looking, will keep you posted. I sent him or her an email too, and said it was way too high, and when they couldn’t sell it for that price, then to email me. I got a nice response stating that they didn’t think it was too high considering its new and hard to find, and to have a nice day. So we are going to keep looking. I did get lucky, my sons classmates grandmother sews. She saw how Gracie is with her bunny and offered to try to make a duplicate. I couldn’t believe it because I don’t even know this woman. I will have to send you a pic, because it is amazing. Its a different material, and it dosen’t have the weight in the arms and legs but its a good replica. It wouldn’t fool anyone, but its a playmate for our bunny and this one will be our out of the house friend, Knuffle bunny is staying at home. The last time we found Imogene the rabbit, which is a Ragtail, it cost $100. Yes, it’s high, but this is a supply and demand business. If someone will pay it, then that’s what it is “worth”. Unbelievable but true I found another Mr. Bunny. I started doing giveaways on my blog: http://alatteinthemorning.blogspot.com and my first giveaway sponsor Katie had one in her playroom! I will still keep my eyes open for you though!!! Thanks Tami- With three little ones I don’t always get time to search. I am watching and will bid for sure. I have my fingers crossed. I just hope my pockets are big enough, im a SAHM and my hubby works for the CA state, times are tough for everyone. My daughters 2nd birthday is coming up in April and this would make a fantastic gift. I appreciate the time you spent, thank you! Katty do you still have the PBK lamb if so, would you be interested in selling it? Contact me at eaharp080 at YAHOO dot COM.